Ross Jackson is Canadian born, but married to a Danish grass roots activist, Hildur, and has been a resident of Denmark since the mid-sixties. As a down-to-earth businessman, with an educational background in engineering and economics, he is forced to confront the meaning of two extraordinary experiences in 1980-82 that lie outside normal conceptions of what is possible. The first is a dramatic contact with powerful energies while in a workshop with Psychiatrist Stanislav Grof. The second is a week-long “awakening” experience at Siddha Yoga master Swami Muktananda’s ashram in India. His experiences were recorded in great detail in 1984, then put away and forgotten for ten years. For several years, in parallel with his business activities as a consultant on financial markets to large institutions, and his growing concern with the degradation of the environment, he seeks out a wide spectrum of possible sources of explanation. These including colorful and dramatic meetings with clairvoyants in London, a visit to Bhagwan Rajneesh’s center in the UK, a week with shaman/anthropologist Michael Harner in Sweden, a visit to Danish master Jes Bertelsen, and a series of bizarre contacts at Findhorn, Scotland, the world’s first “planetary village”. The puzzle becomes more complicated and confusing. Ross Jackson next enters a period of integration of his spiritual insights with his business and environmental interests in 1987 by forming Gaia Trust, a charitable Danish entity with the mandate to support persons and projects that are moving the planet towards sustainability. His spiritual journey is put aside temporarily. Then in the mid 1990’s Ross Jackson comes across the channeled writings of two relatively unknown authors, Ken Carey and Barbara Marciniak, who describe a coming “shift in vibration” due to the planet Earth entering a new energy field, resulting in a “wake-up” call that will effect every person alive. Their descriptions of the effects of the coming energies have a “hair-raising” similarity to his “awakening” experience from 1982, and are juxtapositioned in the book with his ten-year old historical text with startling effect. Ross Jackson’s renewed search for an explanation leads eventually to a satisfactory and deeper understanding of his experiences and the meaning of life after he is exposed to the teachings of “Daskalos,” a Christian mystic from Cyprus, and has an amazing meeting with Sai Baba in India. Finally, he realizes that the ancient Vedas link the new, emerging paradigm with the original divine teachings as we approach the dawn of a new golden age. 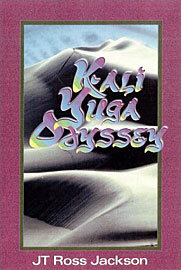 Kali Yuga Odyssey has had a profound effect on many of its readers as illustrated in the reviews section. Yes. It is now out of print. You will have to suffice with the excerpts.